My car was totaled in a car accident. Will I get paid Kelley Blue Book value? I was rear-ended and then pushed into the car in front of me. Am I at fault for this car accident? When is the best time to talk to a personal injury attorney after a car accident? You don’t always need to get an attorney to represent you if you’ve been involved in a car accident. In fact, there are many time when it is best not to hire an attorney if you’ve been hurt in a car accident. However, it is always best to talk to a personal injury attorney before deciding whether or not to hire an attorney. The best person to decide on whether or not you need a personal injury attorney, is an experienced personal injury attorney. An experienced personal injury attorney will be able to quickly and honestly assess your case and determine whether or not you should hire an attorney. Most personal injury attorneys provide free consultations, so there really is nothing to lose by talking to an attorney. The time that you spend will most likely be well worth it. Don’t let the insurance companies take advantage of you after a car accident. You need the advice of an experienced attorney that will know how to navigate you through the situation the other party put you in. The insurance company does not have your best interest in mind, they have their profits and expenses in mind. 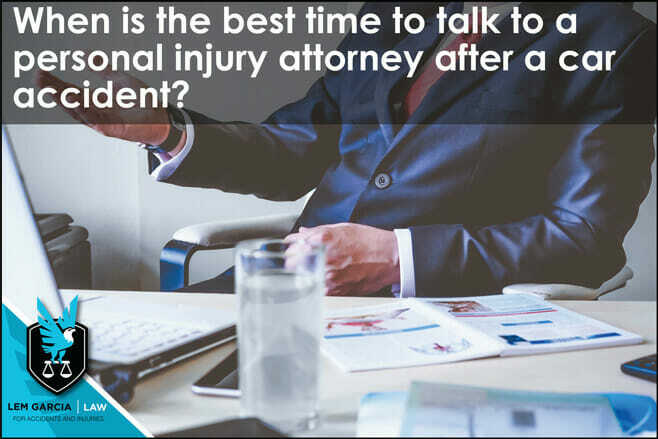 The best time to talk to an attorney is as soon as possible. Make sure that you do not need immediate medical attention and important information is documented right away. Once all of that is taken care of, call an experienced personal injury lawyer right away. At Lem Garcia Las, we are happy to consult with you for free so you know what is best for you and your family. There is no initial consultation fee and there is no obligation to move forward. We’re happy if we’ve been of service to you. West Covina car accident lawyer, Lem Garcia, is here to help.